Eighteen thousand square feet of pure, unadulterated wedding bling! That is how one would describe the latest MyShadi Bridal Expo hosted by Desh Videsh. The spectacular event, which took place on Sunday, September 13th at the Wyndham Orlando Resort, garnered an attendance of over fifteen hundred people who came to visit over sixty different vendors of wedding goods and services. This was Desh Videsh’s second Bridal Expo ever, the first having taken place in South Florida in May of this year. For future brides, grooms, and their respective families, the Bridal Expo was a one stop shop to peruse anything and everything one would need for a dream South Asian wedding. From banquet halls, event planners, and decorators, to DJs, photographer/videographers, and a photo booth renter. There were also mehndi artists, wedding invitation printers, travel agents, jewelers, clothing boutiques, and even a horse & carriage vendor. Caterers and cake artists offered scrumpcious, mouth-watering samples to brides and grooms to give them a taste of their wedding fare. Every guest went home with a goodie bag filled with gifts and coupons, the latest wedding issue of Desh Videsh, as well as a MyShadi Bridal Expo souvenir booklet listing detailed contact information for each vendor. One attendee, Dr. Nelson, whose daughter recently got engaged, was delighted to see so many vendors in one location. She stated, “All of my friends whose kids got married before Desh Videsh started hosting Bridal Expos missed out on the luxury and convenience of gathering wedding planning information all in one place.” Wanting to start her daughter’s wedding trousseau, she was also thrilled with the variety and pricing of clothing and jewelry being sold at the Bridal Expo. with today’s media magic.The highlight of the afternoon was the entertainment segment of the Bridal Expo. This featured three fabulous fashion shows showcasing the hottest trends in bridal wear and grooms wear. Under the direction and choreography of Dolly Patel and Faiza Husain, gorgeous models strutted their stuff in exquisite apparel and breathtaking jewelry provided by Prerana’s Boutique, Apna Andaaz, Vulcal Boutique, and Vaibhav Jewelers. The aud ience was further dazzled by a surprise dance performance by Fusion; a duo that specializes in teaching couples dance routines for their first dance. The performance was a blend of Bollywood, hip-hop, and Latin dance flavors. During the entertainment segment, brides lined up for their chance to catch a garland to win one of several door prizes generously donated by several vendors. Three brides with winning raffle tickets went home with the grand prize of a honeymoon trip for two to the Bahamas. For the vendors, the Bridal Expo was the place to be to get tremendous exposure with direct access to brides and grooms. Vendors had the opportunity to meet face-to-face with potential customers and establish definite leads. Several vendors even went home with signed contracts for their services. 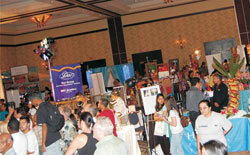 Clothing boutiques and jewelers at the Bridal Expo were pleased with their sales. Anshu Jain of Tabla Bar & Grill in Orlando, was thrilled with the response he got from guests who tried his delicious servings of paneer tikka and delectable tastings of signature desserts. Overall, the MyShadi Bridal Expo was a grand success. Aruna Shah, Publisher of DeshVidesh, states, “It was a pleasure working with so many different vendors. And it was very satisfying getting such positive feedback from brides and grooms who had traveled from all over Florida to come the Bridal Expo.” Desh Videsh is looking forward to hosting several more events in the future. For more information about up coming MyShadi Bridal Expos, please call 954-784-8100 visit www.myshadibridalexpo.com, or email info@deshvidesh.com. I hosted the Fort Lauderdale Show on May 31st at the Hilton Deerfield Beach, which was a HUGE Success for all the brides as well as the vendors. The Orlando September 13th Show was much larger with a lot of variety and another Gorgeous Fashion Show. It was very worthwhile for me to attend. I got several great leads even though I was the most Southern Location represented. The MyShadi Expo was a great event. Being my first Indian bridal show, I was very impressed by the beautiful elaborate set-up and great turnout. Look forward to hosting the next one here at the Tampa Marriott Waterside Hotel and Marina in 2010. Our Hotel is the largest Hotel on the Water in Tampa. Having over 50,000sqft of space to include two beautiful Ballrooms, one 17,169sqft, 22ft ceilings, gigantic chandeliers (accommodate up to 1,200 guest) other ballroom, 8,432sqft, 16ft ceilings and beautiful chandeliers (accommodate up to 600 guests) makes the Tampa Marriott Waterside Hotel and Marina the perfect venue for weddings at any size! We, at Zamana Lifestyles photography & video wanted to deeply thank the Desh Videsh team for planning a well organized and a very successful bridal expo. The team was a joy to work with. It was a huge success for us in terms of meeting a lot of perspective clients, networking with a large number of vendors in the same industry, and at the same time making a lot of very good long term friends! We enjoyed tremendously exhibiting at the expo and look forward to the next one. I would definitely like to appreciate the organised way in which MyShadi Expo was held. All information was clear and transparent. And the leads that were sent after the exhibition was a very good idea from Desh Videsh’s part, as it can really help the vendors to follow up. The hard work and good planning was visible throughout the exhibition. Occasions by Shangrila would like to extend it’s gratitude to Desh Videsh for hosting it’s bridal show in Orlando on Sept, 13. The extensive event planning and co-ordination of the show covered every aspect of the wedding business from marketing, advertising and promotion to bringing prospective client brides together with a wide variety of vendors. We, at Occasions by Shangrila, had consistent business traffic and were able to meet prospective clients from the constant flow of brides visiting our booth. Your warm hospitality made us feel welcome and comfortable and we enjoyed the show as though we were customers too as we were also able to browse and enjoy the great catered food provided especially for the vendors. Thanks again for organizing a classy, professional and memorable event.